Signpost Educational Ltd | Quality supplies for the education sector. Quality supplies for the education sector. LK 83XP GCSE Scientific Calculator ….NEW ! LK 83XP GCSE dual power scientific calculator …..
for KS 3, 4 and especially GCSE. Battery power with solar back-up to prolong battery life. continue to use a very similar calc then the Logik LK 83XP might well fit the bill. 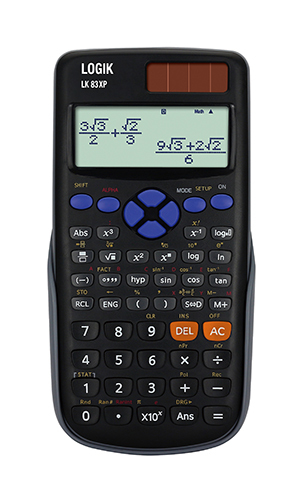 The LK 83XP has 252 functions with “natural display” …so students can enter expressions as shown in textbooks and worksheets. This calc. has all your students will need for their KS 3 and KS 4 and GCSE maths studies. Includes prime factorisation, number tables, random numbers, stats calculations, number tables, algebraic logic, trig functions, regression analysis, hyperbolics, log / anti-log, nine memories etc. Hard plastic keys for durability, slide-on cover to protect the keyboard. Excellent build quality and reliability and with a THREE year warranty (excludes damage to the LCD) Highly recommended.